As we wrap up this series on selling your home, remember that, when you have a top agent, all the time, energy and money you put into selling your home is directly reflected in price that is paid for it when it sells! If it helps, think of it this way – You are getting paid well for all this! In the 3rd and final post in this three-part series, we look at Tips 7-12 – Your pets, the pet peeves of buyers, pricing your home and more. If you missed the earlier posts, click to read: Part 1 or Part 2. I love my two dogs very much; however, not everyone is a pet-person. When selling your home, it is important to remember this fact. During an open house, pets and their food, toys, odors and fur-balls should be kept completely out of site. Even the smell of your pet’s food could make a potential buyer think twice and the occasional fur ball gives the idea that your home is not clean. Prior to an open house, move your pets out for a few days and clean up much of the evidence that says they live there. Talk to your Realtor about what is best in your particular situation. Also, depending on the market in which you are selling your home, and your Realtor’s ability to sell your home in short order, you will want a game-plan for minimizing your pet’s presence when your house is shown. When selling your home, I encourage you to take this into account and plan for success! 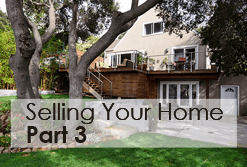 Tip 8 – When Selling a Home It’s Ready, Set, Show! Until your home is sold, when selling your home you must always be ready to show it. ALWAYS! Imagine that it is 8 o’clock on a Tuesday night and you have just received a call. There is a very motivated, cash buyer whose husband came to the open house over the weekend. She has not yet seen your house in person and just wrapped her meetings for the day. She is headed out of town in the morning for a week-long conference. She could be there in 20 minutes and just wants to take a quick look. If it’s as perfect as her husband says it is, they are ready to make an offer tonight before she heads out of town in morning. Would you be ready? While you hope you will have more notice, and you could certainly say no, what if THIS were your best buyer? Remember: Chance favors the prepared seller – Always be prepared! Yes, buyers will look in your dishwasher, trash cans, closets, cabinets, drawers – If it opens, it is fair game. And when selling your home, you must sweat the small stuff – Because buyers have plenty of pet peeves! When selling your home, your dishwasher needs to be fresh, clean and empty! Keep the inside of it gleaming and free of both hard water stains and build-up on the heating coils. Check with the manufacturer for the best ways to do that. Keep your sink empty and free of dishes and water spots! Make sure the kitchen cabinets, pantry and spices are all neat and well-organized. Run a chunk of fresh lemon through your disposal to make sure it’s ready for inspection by those who take a close look. Keep a stash of fresh liners in the bottom of each waste basket and trash can around your home so you can quickly whisk away any trash before a prospective buyer arrives. Make sure to ask your Realtor about the pet peeves of buyers in your local market. And if you live in the San Francisco Bay Area, I can certainly speak to buyers in our area. One universal tip to realize top-dollar when selling your home: You MUST price it correctly right out of the gate! This is where an experienced agent really matters. There are all sorts of “secret formulas” and “expert advice” out there when you are selling your home. My best advice to you is this, find an experienced, TOP agent in your market and trust them! They know your market. They have the experience. They actually SELL homes. And THEY know the best pricing strategy for selling your home. You want to look for a top-agent that really knows your market point by point. You want to choose an agent that really listens to what YOU want and then delivers more than expected. Experience counts – Especially if you want to realize top-dollar when selling your home! Choose an agent that consistently delivers as a top-agent in their market, one that has a deep bench of resources that you can utilize when needed and one who has lived, worked or otherwise has a personal understanding of the area in which you are selling your home. Once you choose your agent it is crucial that you put your full faith in them. If you live in a dynamic market, you often need to swing into action quickly. If you have chosen a top-performing agent, they know what will get the job done and if you listen to what they say, you will reap the rewards. The best Realtor is also an expert project manager. Getting a house ready for market is much like assembling a puzzle at lightning speed. The exceptional agents think quickly and coordinate moving parts faster than you can even think of them. Again, when selling your home, LISTEN to your agent and take action on what they say. Clients that trust me to prep their home for sale find that I minimize the upheaval, optimize the bang for their buck, maximize the net effect and increase their final profit. You want the top-agent in your local market to do the same for you! So that is it – My 12 Tips! Oh, I promised to share the links to my posts about: Curb Appeal and Home Staging – I encourage you to give them a read.